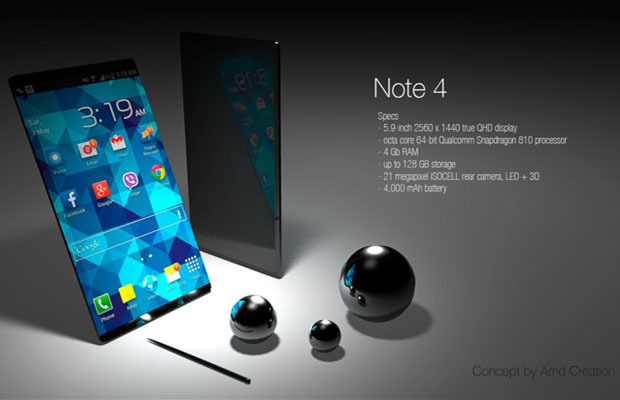 Just a few weeks away from the official launch of the Samsung Galaxy Note 4, the phablet concepts keep pouring in. Amd Creation’s latest rendering proves to be the more eye-catching and high powered of the batch, decking the next-gen smartphone with the latest specs such as a 5.9-inch (2560 x 1440) display, octacore 64-bit Snapdragon 810 CPU with 4GB of RAM, 21MP ISOCELL rear camera, and 128GB of storage. The most prominent feature looks to be its massive 4,000 mAh battery inside, which is nearly double the size of what’s inside the more recent smartphones on the market. And what good with the Galaxy Note 4 be without its own S-Pen? This specific version of the digital stylus is integrated on the bottom right of the handset, sharper and slimmer than previous versions. Not bad.